Am 28. und 29. November 2012 lud die VolkswagenStiftung zum Herrenhäuser Symposium "Already Beyond? – 40 Years Limits to Growth". Keynote Speaker war unter anderem Dennis Meadows, Mitautor der weltberühmten Studie (in 30 Sprachen übersetzt, neun Millionen Mal verkauft). Die Dokumentation umfasst Audiomitschnitte ausgewählter Vorträge, Fotos der Veranstaltung sowie die Ergebnisse der angebundenen Winter School "Limits to Growth Revisited". 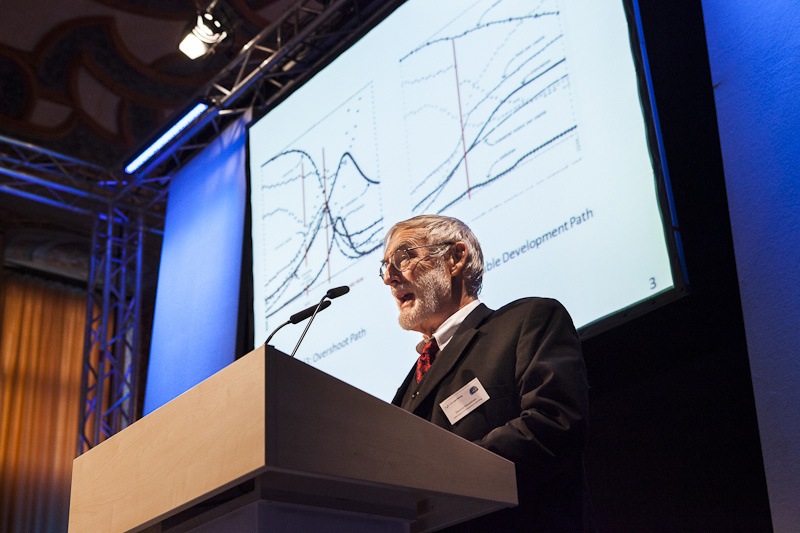 Dennis L. Meadows, Co-Author of the study "The Limits to Growth", during the Opening of the Herrenhausen Symposium. To mark the 40th anniversary of the “Limits to Growth” study by Dennis Meadows and others, funded by the Volkswagen Foundation, as well as to underline its relevance for the years to come and the future of humankind, a two-day symposium "Already Beyond? – 40 years 'Limits to Growth'" was held on 28th and 29th November 2012 in Hanover, Germany. Feeling a bit uneasy? – Limits to Growth and 21st Century Policies, Attitudes, and Lifestyle. Where shall they all go? – Demographic Challenges and Limited Space. Growth with less? – The Limits of Economic Growth. Can we remain ignorant? – Climate Change and its Impact on Global Governance. What shall we eat, what shall we drink? – Global Water and Food Management. Background of "Limits to Growth"
A bit more then 40 years ago, a small group of researches at the Massachusetts Institute of Technology in Boston dared to look into the future. They summarized their results in a book that would become one of the most influential texts of the 20th century: "The Limits to Growth". One of its leading authors was the economist Dennis L. Meadows. 40 years later, the Volkswagen Foundation organized a conference with the title: "Already Beyond? 40 Years Limits to Growth". During the conference experts looked at the effects of the study and what it means for us today. Dennis L. Meadows gave the opening address. Video: Interview with Dennis Meadows on "Limits to Growth"
In the context of the Herrenhausen Symposium "40 Years Limits to Growth" by the Volkswagen Foundation (November 28 -- 29, 2012), Dennis Meadows was interviewed by Christiane Grefe (DIE ZEIT) during the final session of the conference "WISSENSWERTE" in Bremen on November 27, 2012. What is at stake for future research and research funding? A Winter School on "Limits to Growth Revisited", which was addressed to 60 young researchers of all relevant fields, took place in the week running up to the symposium. Following the event, the participants developed a "White Paper" report which shows their perspectives on the various subjects discussed within the Winter School. Plenary Session 1: "How to Rock the World. Limits to Growth and its Impact"
Plenary Session 2: "Models vs. Reality: From Early Conceptual via Linear to More Advanced Models"
Plenary Session 3: "The Limits to (Population) Growth - Personal Perspectives of a Demographer"
Plenary Session 4: "Global Food Security and Natural Resource Scarcities: What are Sustainable Strategies"
Professor Roland Rau on "The Limits to (Population) Growth - Personal Perspectives of a Demographer". Plenary Session 2 with Prof. Jürgen Kurths. Workshop at the Winter School "Limits to Growth Revisited". Plenary Session with Professor Jürgen Kurths on "Models vs. Reality: From Early Conceptual via Linear to More Advanced Models". ... and during the sessions the participants of the Winter School had time to discuss their ideas with Dennis Meadows. Fellows in one of the sessions of the Winter School in Visselhövede. Group picture of the 60 participants of the Winter School. Dennis Meadows often uses games to illustrate his messages, here with some of the participants of the Winter School. Plenary Session with Professor Matin Qaim on "Global Food Security and Natural Resource Scarcities: What are Sustainable Strategies". Plenary Session with Dr. Frank Uekoetter: "How to Rock the World. Limits to Growth and its Impact". A workshop group presented their results on "Change Communications". Plenary Session with Prof. Roland Rau. 60 Fellows were invited to participate in the Winter School. The Winter School took place at Hof Sonnentau, which is located in the beautiful and quiet rural landscape of Visselhoevede. Program: Herrenhausen Symposium "Already Beyond? – 40 years 'Limits to Growth'"